This page refers to uploading 2D linear videos. If you are uploading 360 videos, please see the Steam 360 Video section. Video File Specifications can be found here. The Steam Video Upload feature allows a partner to directly upload the video file to be processed into the video system. Once processed, the video will be available for configuration and release to customers. The documentation below highlights the functionality of the Video Upload page. To upload your video, navigate to the landing page for the video and click Manage Video, then from the Video tab, select Upload. The main input file refers to the MP4 file that contains the default video and audio track that a user would watch. If you do not have alternate language, audio commentary tracks, etc., this is the only file you will need to upload. Set the file using the File Chooser or drag-and-drop the file into the Input File box. Once the main input file has been selected, it should load into the Main Input File Preview. This is a direct load from your computer for visual reference only. You should use it to confirm you've selected the correct file for upload, and for review if you are setting the Video Type or Crop options. If your video has additional audio or video tracks (languages, audio dubs, commentary tracks, alternate angles, sound mixes, etc.) you can supply those files using the Alternate Video and Alternate Audio section. Alternate tracks can not currently be uploaded at a different time than the main input file. Please upload the main and alternate video files all at one time. 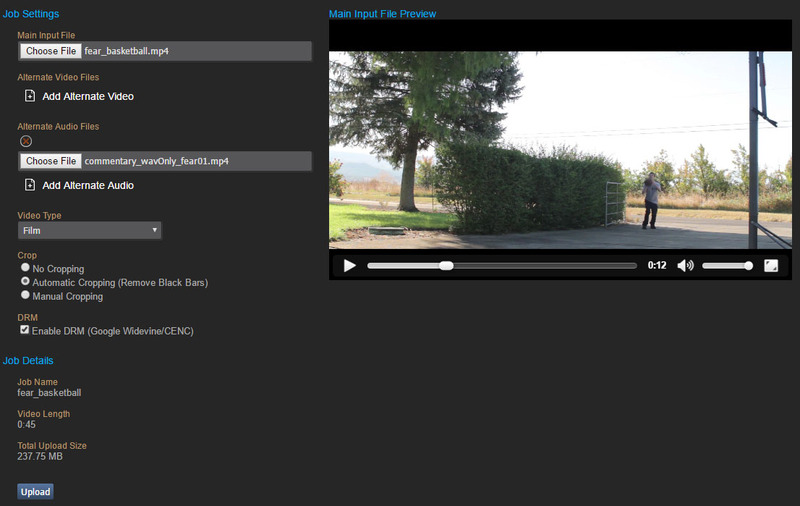 Use this dropdown to select the type of video content that is being processed. This will adjust the conversion process according to the content type to deliver a higher quality stream for customers. Use Animation for animated, cell-shading, tutorial videos, etc. Use Film (with grain) when the original video has a dark or existing grain look. This conversion process will attempt to keep as much of the grain as possible. Unlike video solutions that are only plugged into TVs, Steam customers have a large variety of monitors in different resolutions and aspect ratios. To better support this variation and in particular ultra-wide monitors, we recommend delivering videos with no black bars when aspect ratios are wider than 16:9. In addition, by not wasting encoding time and bit rates on the black bars, the actual contents of the video can be encoded faster and at a better rate. To automatically remove any black bars (above/below or left/right), select Automatic Cropping. The conversion process will scan the first 5 minutes of the video for determining the regions to remove. Choose Manual Cropping and set the parameters if you know exactly where to crop. Width and Height refer to the final frame size after cropping. X/Left and Y/Top represent the point to start the crop from. By selecting Enable DRM, your video will be encrypted using Google Widevine. This is transparent to the user as the Widevine decryption module is installed by Steam silently. Upon playback, the video player will both confirm ownership of the video in Steam and grant a time-restricted license for playback that allows for decryption of the video content for playback. For videos with a rental option, we recommended enabling DRM as the time-restricted license will be matched to the end of the rental period. Optimize Upload for Faster Network Connections (Experimental, disable for slow connections) - This will increase the number of simultaneous connections during upload. It does require at least 6Mbps upload. If a video upload fails, turns this setting off and try again. Once the upload form has been filled in, click the Upload button to begin the upload of all the files to the Steam processing service. The Job Details section will indicate the progress for each upload in process. Once the upload is complete, the Video Upload tab can be closed. Navigating away from the video tab during upload will result in a warning dialog confirming you wish to continue. Should you do so, the upload process will be stopped. The processing of a video takes 1.5x-2.0x the runtime of the video files uploaded. If a processing job fails, a Valve representative will contact you directly. If the video isn't available in the Video Management tab after 24 hours and you haven't been notified of an issue, please use Contact Steam Publishing form to connect with us.